How many stitches do you need to finish a quilt? How much quilting thread will I need? 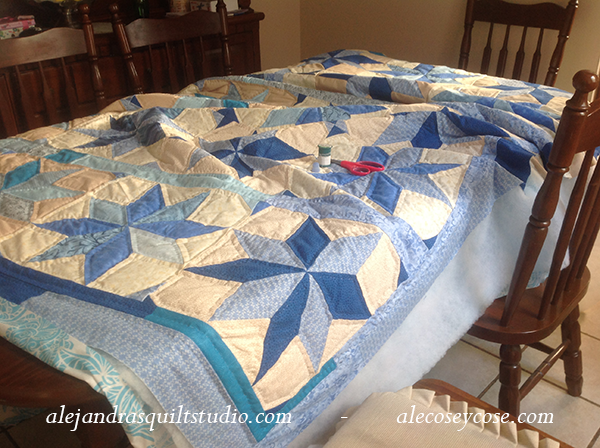 How long does it take to finish the hand quilting? Do I need to make it by myself? I can listen to you asking me all those questions about hand quilting, and I’m sure you will have more questions about hand quilting a big quilt. If you’re a beginner and you want to make your first quilt, a baby quilt will be perfect for you, the smallest size of a quilt for a beginner will be the best. If you don’t want to make a baby quilt, you can make a lap quilt, they are small enough to be quilted in a couple of weeks and a lap quilt doesn’t require too much work to finish it. In time, when you get some experices as a hand quilter, you will be able to make any size with no problem. A king Size Quilt is a challenge! 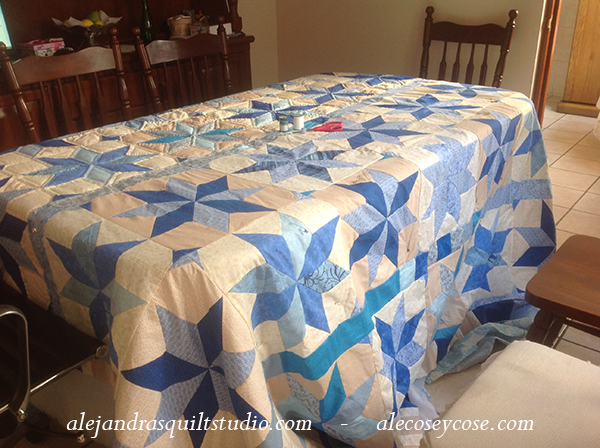 Do you remember I told you about this quilt I’m making for my oldest son, and how a quilter lives in Canada, these last two weeks I have been working on the hand quilting. A king size quilt is always a challenge to finish it, it doesn’t matter if you quilt it by machine or by hand, it will take some work and some time to finish it. Don’t see the size of the quilt as a whole, I use to look at each one of the blocks as a “to do list” for every day, this way I can focus on one or two blocks per day, and soon in a week or two I got half way. Today I have some photos to share with you here on my blog, photos quality might no be the best, as I have not my regular camera with me, I took these photos this morning before I started to work on the second half of the quilt with my IPad, quality is not the same, but I think the point it to show you how I work on the hand quilting. Hand Quilting is an Art. I’m sure of it, hand quilting is an art, it takes some time to finish a quilt, and it requires some skill to do it, you might have read or see quilters working in a different way, and I need to say, every way a quilter works on her quilt is the right one. 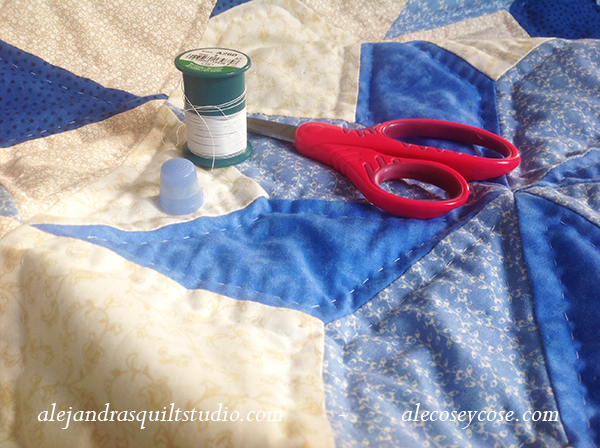 You might develop your own style to work on a quilt and it will be perfect too. I still work on my hand quilting as I learned a few years ago. And it works for me. What tools I need to do hand quilting. I still use a few tools to work on the hand quilting, my small fiskars scissors, quilting thread and a thimble to protect my finger. It can takes some time to get used to work on the hand quilting with a thimble if you’re not used to sew with it, but I highly recommend to use one, as you will be working for a while your fingers can get sore. As I said, every quilter will find the way that works best for her (him), I like to work on the hand quilting, by placing the quilt on a dinning table, it makes perfect to hold the sandwich in its place while I work on it. As house is quite during the morning, my grandson is at school, so I have a quiet place to work for an hour or two, I don’t like to work longer everyday, as hand quilting requires some skills to work on it. One or two hours per day, it’s fine for me, I don’t get sore, and I can go back to work on my quilt next day. On this photo, you can look the moment I finish first half of the quilt, I also could trimmed the batting fabric and the fabric for the back, this side is ready to work on the bias. Hand Quilting is like a challenge, but it’s also like taking some time to take some time for myself. It’s not hard to do, and it gives me some time for myself and for my thoughts. Don’t look at the King Size Quilt as a whole to work on, I use to look one or two blocks as my “to do list” for every day, this way my goal is not big and I can make it, and I’m ready for next day. This quilt has 38 blocks, plus 3 borders in between of the stars, and four borders, so I divide blocks and border as a day challenge to work on it. 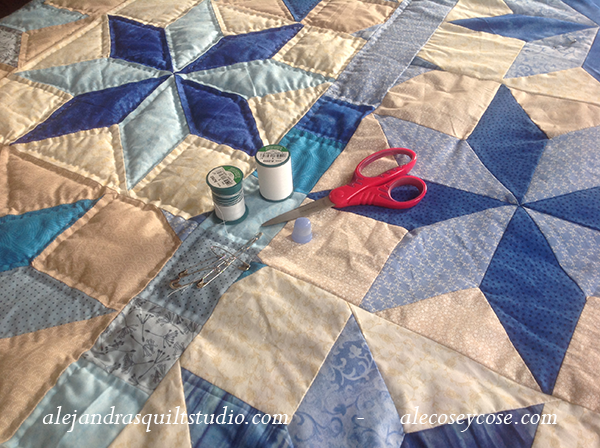 Do you like hand quilting? Do you hand quilting or machine quilting? I thank you for your visit and the time you make to read my quilting adventures, I hope soon I’ll be telling you this quilt is finished. If you have any question about my hand quilting, leave a comment, I will answer to you. ← A quilter’s life in Canada.